Hugo enhances the colours of Structure Twelve’s floor with a light spray before photography. We begin today with a warning for the douce residents of Old Meldrum, in Aberdeenshire. There is a woman in your midst, charming and modest, who nevertheless has a most alarming way with vodka. We speak of Mrs Ethel Mitchell, mother of finds hut Anne, whose darkest secret was revealed when we were required to clean the windows of the site hut in order to display a magnificent incised stone for the Open Day on Sunday. 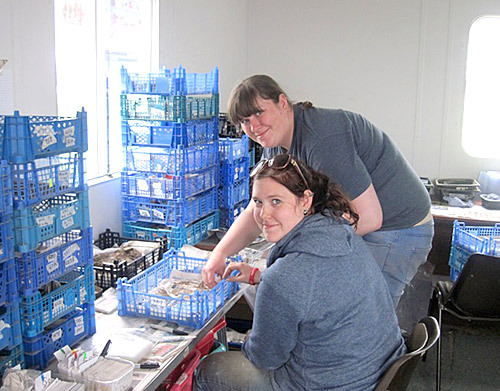 Lauren and Emma continue with the monumental task of cataloguing the many discoveries in the finds hut. The window in question has probably never been cleaned before. It was, frankly, opaque with dirt. Shot-blasting would have been the most obvious way of removing the layers of grime but the hut would probably have disintegrated around it. Anne claimed to have the solution — her mother’s secret recipe for window cleaner, guaranteed to succeed where mere violence would fail. The window sparkled and the many hundreds of visitors were able to see the details of the stone clearly. It was the recipe which surprised us. Anne describes it as a dollop of vinegar, a drop of Fairy Liquid, cold water to make it up to a half-litre and the secret ingredient, a further dollop of vodka. Hugo’s pole-camera is once again brought into use — the results of which will eventually produce stunning 3D images. Seeing our shocked faces she tried to back away, claiming any white spirit would do. The secret of Old Meldrum’s gleaming windows is out. Furthermore, it explains Mark Edmonds’ strange insistence on helping with the window cleaning, a task which Jen assures us he never attempts at home. Ah well, back to the archaeology. Cleaning, in preparation for photography and laser recording, was the order of the day. Most of the diggers were dragooned into work gangs, travelling from Structure Fourteen to Structure Twelve and then vacating the premises for Hugo’s official photography. The ‘rain monster’ over Structure Ten. This was followed by his pole-cam photographs for a forthcoming three-dimensional panorama (click here for a fine example of a previous model) and finally by Mark and his whirring laser machine. For once, the weather played ball and the gusting, nagging wind brought in a soft, but distant, mist to create nice conditions for photography. Mention of laser recordings brings us to the “rain monster”, which is another way of describing one of the abilities of the laser equipment. To understand the reference, look at the laser image to the right. 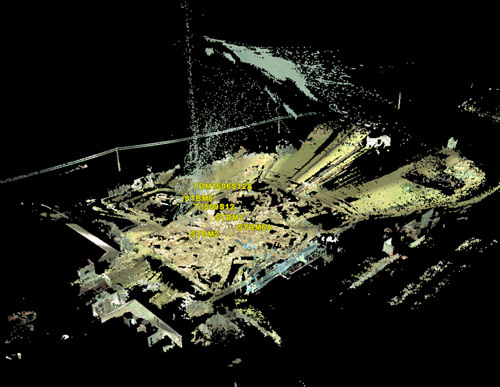 It is a screenshot of an incomplete laser scan of Structure Ten, but it has also captured clearly a cloud of rain which happened to be passing by. Yes, laser equipment can actually scan rain! Mark and Beth assure us that the rain will later be processed out to create a “clean” 3D model. Nick delights in the high-resolution of this equipment and points out that the laser, and the many and varied other methods we use here, illustrate the remarkable site record which is being built. The detail of the narrative is startling and the site record, when complete, will be one of the most exhaustive ever assembled. 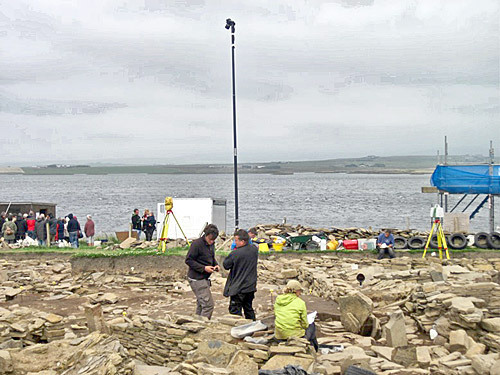 How many archaeologists does it take to clean a structure at the Ness? Many! Orthostats forming the stalls at the Midhowe tomb, in Rousay. Meanwhile, in Trench T, more walling has appeared at the bottom of the trench — but we are no nearer establishing what sort of building is here. It appears to have been badly robbed-out, but there is a possibility that it may be a chambered, or stalled, tomb of some sort. 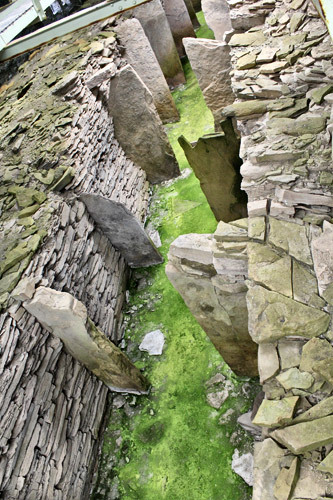 Ben points out that the Midhowe stalled tomb, in Rousay, utilises orthostats to define side recesses. Are we seeing something similar here? Frankly, we have no way of knowing at the moment. Chambered tombs were not immune from stone-robbing. 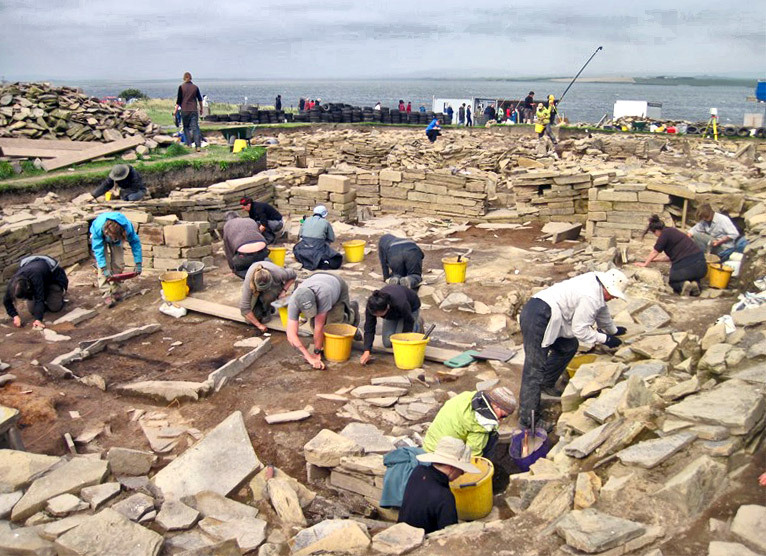 In 2002, a short distance to the north of the current Ness of Brodgar dig site, Nick excavated the Bookan chambered cairn and discovered a tomb there that had been almost levelled before a stepped edifice was built on top. Nor is there any human bone in Trench T to hint at a tomb. The potential floor areas are very clean, but soil conditions may not be conducive to the survival of non-burnt bone. 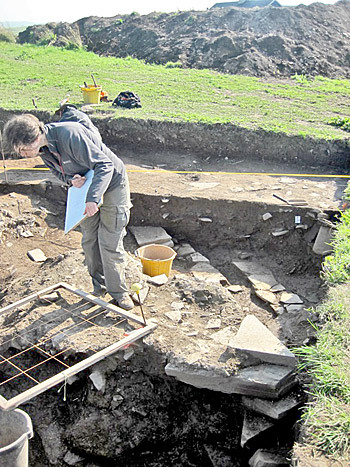 Planning in Trench T, around the newly discovered walling. Phosphate analysis may be the only way to settle that question but it will be next year before we can attempt to join up the dots of this most enigmatic trench. Almost last, but by no means least, Georgie has found some delicate incised pottery in her area of Structure Nineteen, just a metre from the fine incised stone found last week. It is in perilous condition and a fuller description will have to wait until we can manoeuvre it up to Lochview without the danger of gusting wind. We will tell you more tomorrow. And finally, our guidebook, which was launched in June, is almost gone. We printed 5,000 copies, assuming they would last us for a long time, but it has been so riotously successful that only a few are left. If you want one and can’t get to the site or shops, it can still be ordered online here. 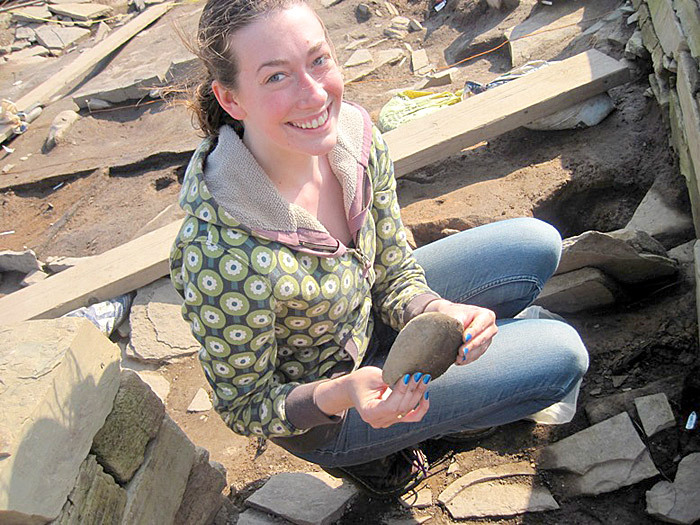 Tansy, on her last day, discovered a beautiful polished and ground stone knife.